Located in Swanwick, Derbyshire and commissioned by the Local Authority, this purpose built, 5 bay Modular Building now provides a modern, safe and much needed additional "double classroom block" to the school. This prefabricated Classroom Building provides a total floor area of 165 sq. m and incorporates 2 No. classroom areas each providing over 60 sq. m of teaching space. A fully equipped and DDA compliant disabled toilet, 2 No. children's toilets, stationery stores and double glazed aluminium entrance doors are also provided. A hot/cold air conditioning system keeps the fully carpeted classrooms at a constant temperature and a suspended ceiling system with Cat 2 lighting is provided throughout. The building is fully compliant with all Building Regulations including BB93. 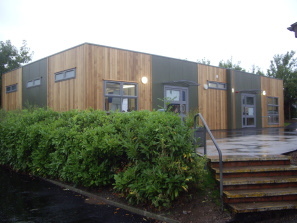 Externally, the walls of this Portable Classroom Building are finished in a combination of easily maintainable plastisol steel and western red cedar vertical boarding. The roof is constructed with a raised parapet detail concealing a mono pitched flat roofing system covered with 3 layers of built-up-felt. This Modular Building was installed during a weekend to minimise disruption to the school and the Health and Safety risks to both children and staff.